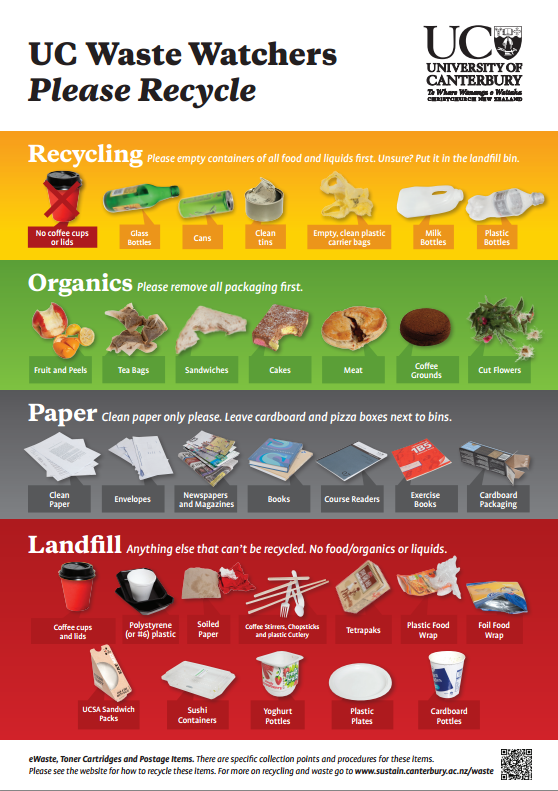 Changes to UC’s waste system are being rolled-out from this week to minimise the contamination of our campus recycling. Some items that used to be recycled must now be put in the red landfill bins. This is because some types of plastic and packaging are no longer being accepted by UC’s end-point recyclers. You can make a difference by sorting your waste correctly. Take notice of the waste stickers and posters in your area. New stickers and posters showing the changes (like the one above) will be implemented from December 2015 to January 2016. Keep an eye out for when things change in your area. Sort your waste according to the new stickers and posters. If in doubt, put your item into the red landfill bin. This will prevent recycling becoming contaminated. Encourage people in your area to recycle right. If you see someone doing it well, recognise them! If you see someone struggling with what to put in the bins, help them! Why is it important to recycle right? Sorting your waste correctly and knowing what to recycle minimises the contamination of our recycling, ensuring it is accepted by end-point recyclers. Maximising the volume of recycling on campus is part of UC’s commitment to addressing waste-related sustainability issues. Recycling right helps to minimise the amount of waste UC sends to landfill. This reduces our waste-to-landfill charges and is better for the environment. If you have questions, please contact the Sustainability Projects Facilitator Katie Nimmo at katie.nimmo@canterbury.ac.nz, or call her on extn 6025. Current Chancellor Dr John Wood and current Pro-Chancellor Ms Sue McCormack have both been re-elected for a third term on the UC Council. Both appointments are for a two-year term to 31 December 2017, the first time an appointment to a two-year term has been made. ‘Teaching as inquiry, with a focus on priority learners’ is hot off the press from the New Zealand Council of Educational Research (NZCER), and addresses the question of how teachers might manage Teaching as Inquiry (TAI) as part of their everyday work in schools. The author is Professor Lindsey Conner from the UC’s School of Education, Health and Human Development. The book is based on success stories from teachers and the school advisors who have written about specific changes in their teaching to meet the needs of their priority learners. It will provide a wealth of examples and useful strategies schools can continue to implement. A user fee has been introduced for users of the access road to the top of Mt John, from 30 November. The local astro-tourism operator, Earth & Sky Ltd, which also runs the Astro Café on Mt John’s summit, is managing the daily road access. UC supports this endeavour to raise money for the betterment of the private road, to preserve the unique qualities of the Mt John area and to maintain future access to the summit. All University of Canterbury staff and students can gain free access to the road by showing their Canterbury Card. This is the only photo ID accepted at the gate. Currently narrow and steep, the private road was built in the 1960s to provide working access to the University of Canterbury Mt John Observatory but has become popular with local and international visitors, especially since the opening of the Astro Café on the summit and the development of the DOC walking track around the hill. There have been more than a million visitors to the top of Mt John in the last decade. The income from the road user fee will ensure that the increasing numbers of visitors to the top of Mt John can pass safely and enjoy their visit to the unique environment. Tuatara: Biology and conservation of a venerable survivor , published by Canterbury University Press, is on the inaugural long list for the 2016 Ockham NZ Book Awards in the illustrated non-fiction category. The book is the culmination of almost 30 years of research on tuatara and their conservation management by author and biologist Dr Alison Cree. It is the first detailed monograph for decades about this enigmatic reptile, and the first to be illustrated in colour throughout. The evolution, natural history and conservation of tuatara are covered in comprehensive detail, providing a resource for the specialist yet in a style accessible to a wide readership. The 2016 Ockham New Zealand Book Awards are judged by 12 eminent academics, writers, journalist, commentators, former publishers and booksellers from around New Zealand. There are 10 longlisted books in each of the four categories. The judges will reveal their shortlist on March 8, 2016, and the winners will be announced at a ceremony on May 10, 2016 at the opening night event of the Auckland Writers Festival. Click here to buy Tuatara.